In a 5-4 decision Monday, the Supreme Court upheld the use of the sedative midazolam for lethal injections. The drug is not approved by the FDA and was used in the botched execution of Clayton Lockett, who suffered a massive heart attack after the drug was administered improperly, according to NPR. 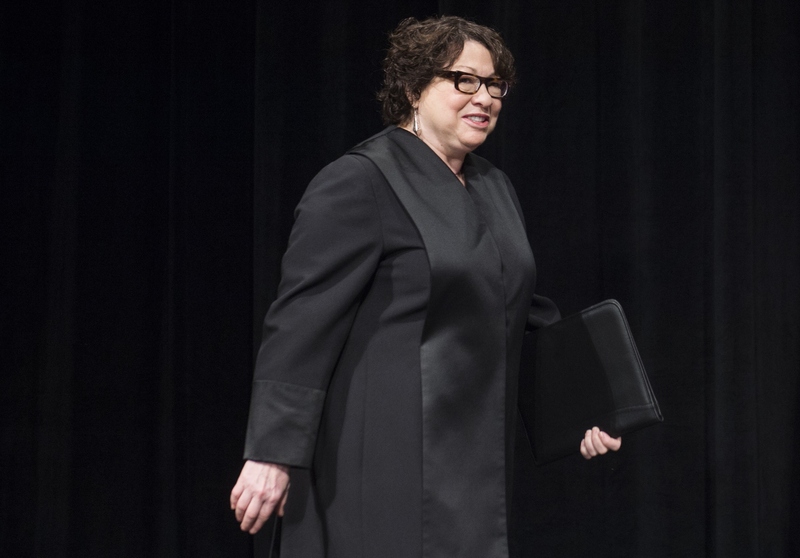 Justice Sonia Sotomayor was one of the four liberal judges who dissented. In her dissent, she called out the poor scientific evidence that midazolam even works well at rendering people unconscious and cites the cases where the drug has only prolonged the execution process. The best quotes from Sotomayor's dissent against using midazolam in lethal injections show exactly why the drug arguably violates the Eighth Amendment's prohibition on "cruel and unusual" punishment. The use of the drug was ultimately upheld by the Court's five conservative justices, with Justice Samuel Alito writing the majority opinion. He dismissed Sotomayor's claims that the drug prolongs executions as "groundless." He wrote that the court upheld midazolam's use, first, because the prisoners failed to identify a "known and available alternative method" for their own executions, and, second, that the prisoners did not establish that Oklahoma's use of midazolam "entails a substantial risk of severe pain," according to NPR. Some states have turned to midazolam to put prisoners into an unconscious state before administering two other drugs that paralyze the inmate and stop his heart, according to NPR. The two latter drugs are known to cause a lot of pain if the inmate isn't properly sedated. These are a few of the good reasons Sotomayor dissented so strongly against the use of midazolam. The Court today turns aside petitioners' plea that they be allowed a stay ... in two ways: first, by deferring to the District Court's decision to credit the scientifically unsupported and implausible testimony of a single expert witness; and second, by faulting petitioners for failing to satisfy the wholly novel requirement of proving the availability of an alternative means for their own executions. As a result, it leaves petitioners exposed to what may well be the chemical equivalent of being burned at the stake. All three experts agreed that midazolam is from a class of sedative drugs known as benzodiazepines (a class that includes Valium and Xanax), and that it has no analgesic — or pain-relieving — effects. They [the experts] further agreed that while midazolam can be used to render someone unconscious, it is not approved by the Federal Drug Administration (FDA) for use as, and is not in fact used as, a "sole drug to produce and maintain anesthesia in surgical proceedings." Finally, all three experts recognized that midazolam is subject to a ceiling effect, which means that there is a point at which increasing the dose of the drug does not result in any greater effect. ...while "midazolam unconsciousness is ... sufficient" for "minor procedure[s]" ... it is incapable of keeping someone "insensate and immobile in the face of [more] noxious stimuli," including the extreme pain and discomfort associated with administration of the second and third drugs in Oklahoma’s lethal injection protocol. In reaching this conclusion, the Court sweeps aside substantial evidence showing that, while midazolam may be able to induce unconsciousness, it cannot be utilized to maintain unconsciousness in the face of agonizing stimuli. Instead, like the District Court, the Court finds comfort in Dr. Evans’ wholly unsupported claims that 500 milligrams of midazolam will “paralyz[e] the brain.” In so holding, the Court disregards an objectively intolerable risk of severe pain. But just because a purported expert says something does not make it so. Especially when important constitutional rights are at stake ... they provide no indication of the effect one would expect midazolam to have on the brain at substantially higher doses. ... One might as well say that because some people occasionally die from eating one peanut, one hundred peanuts would necessarily induce a coma and death in anyone. A method of execution that is intolerably painful — even to the point of being the chemical equivalent of burning alive — will, the Court holds, be unconstitutional if, and only if, there is a "known and available alternative" method of execution. "By protecting even those convicted of heinous crimes, the Eighth Amendment reaffirms the duty of the government to respect the dignity of all persons." Today, however, the Court absolves the State of Oklahoma of this duty. It does so by misconstruing and ignoring the record evidence regarding the constitutional insufficiency of midazolam as a sedative in a three-drug lethal injection cocktail, and by imposing a wholly unprecedented obligation on the condemned inmate to identify an available means for his or her own execution. The contortions necessary to save this particular lethal injection protocol are not worth the price.